Late at night, in the fall, The Hub provides such a cozy and festive feel. It may not be Christmas, which is traditionally more associated with family and nostalgia, but the heart of Disneyland during Halloween Time still triggers the feels for me, because I love Halloween season so much. It's a time for spooks and frights, but it's also a time of fun and festivity. The warmth of the season is inherent in its very autumn palette, as well as the glowing pumpkins and flickering flames. Somehow, this--my favorite time of year--gives me peace, despite its typical connotation for the opposite! 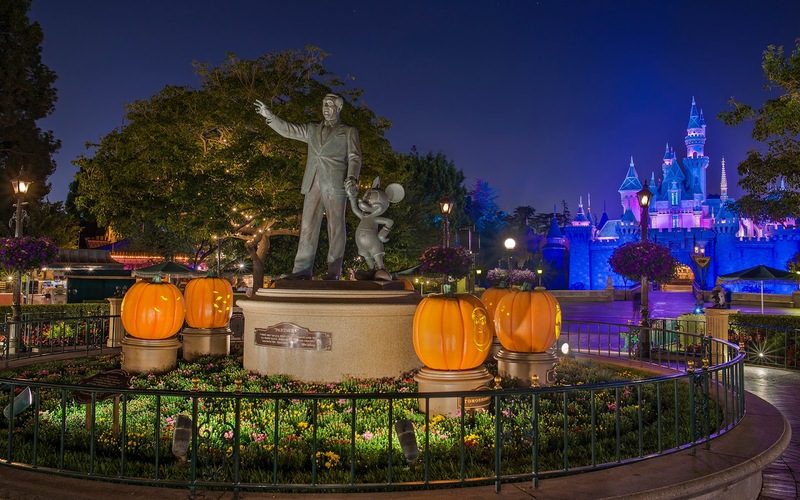 Walt and Mickey once again share the jack-o-lantern stage with a normal Sleeping Beauty Castle, now that the Disneyland Diamond Celebration has ended.